I realize that, despite the repeated warnings of Mr. Bradbury, I have spent all day in the company of screens. What kind of life is that for a human? your eyes are just a tad more buggy. Vive la France! This is the scariest drawing of you EVER. Oh wow. I know that feeling. PS, "enefrifi"... man, word verification is GRRRREAT! this is so great. you are brilliant, Jake. But it's just so helpful... I mean, how else am I going to find out random info WHEN I NEED TO KNOW NOW!, ? 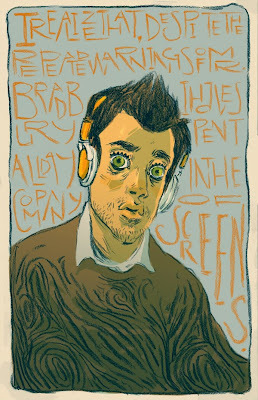 This is kind of frightening, and kind f the most accurate self-portrait ever. bahaha! love this. in a sad, poor-jake-but-sweet-design kind of a way. Holy CRAP! WOW, that is it. Just WOW. The end. I love this twisted style! It's like a blend of Art Nuveau and 70's pop-ink (whatever that phase was called) this is tight! PS I looked in the Ensign the other day and saw an illustration that looked a _lot_ like your more commercial stuff. Have you done something for them? i love this picture of you! Cheslea says it's scary, but i think it's a great portrayal. humans are kind of strange looking, when you think about it. really brilliant lines, colors. and the rest.